But it doesn’t taste like salad, which is key. 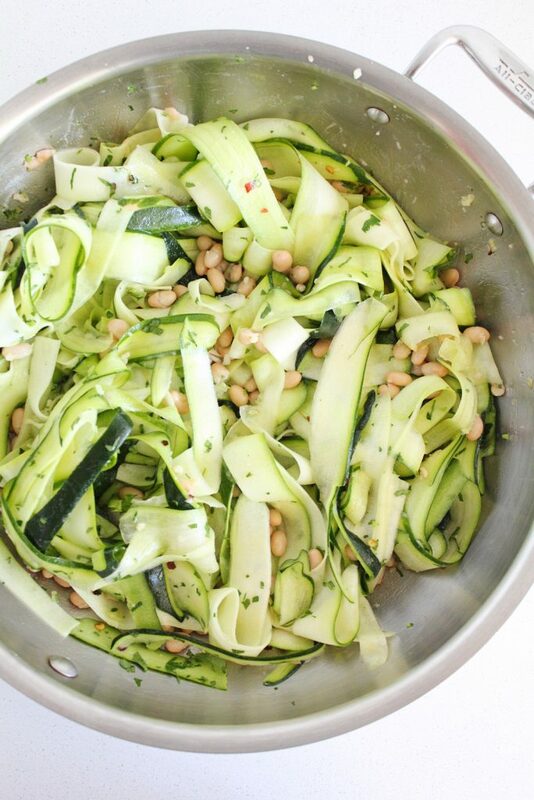 We have used zucchini noodles in pasta recipes on here before, and it’s because I really like them, and think that they are an incredibly close textural sub for real pasta. And it’s zucchini, you guys. 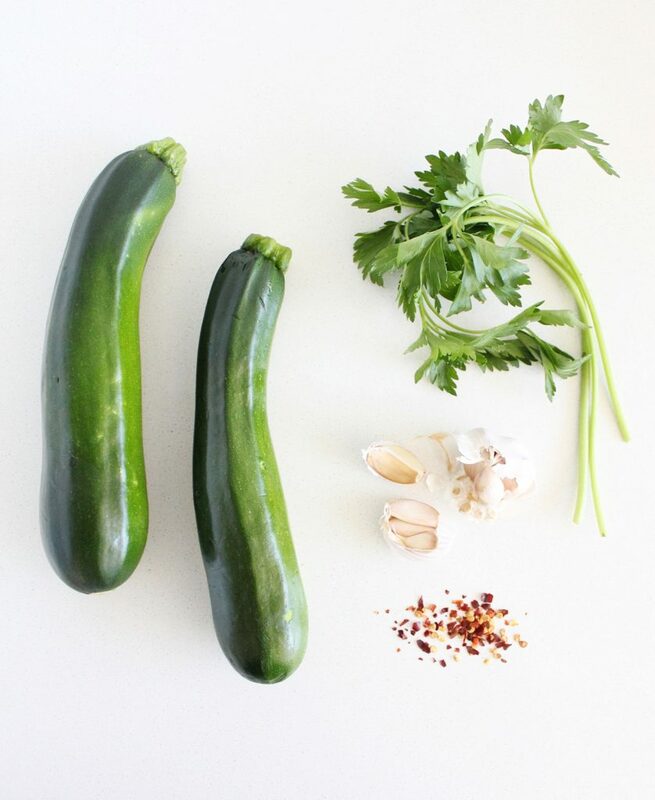 Not zucchini and flour, not zucchini and some gluten-free starches, it’s just zucchini, that green guy that is all too willing to be all over every farmers market, that sometimes gets mistaken for cucumber, that no one ever seemed to know what to do with. Until züdles were born. And thank goodness they were. 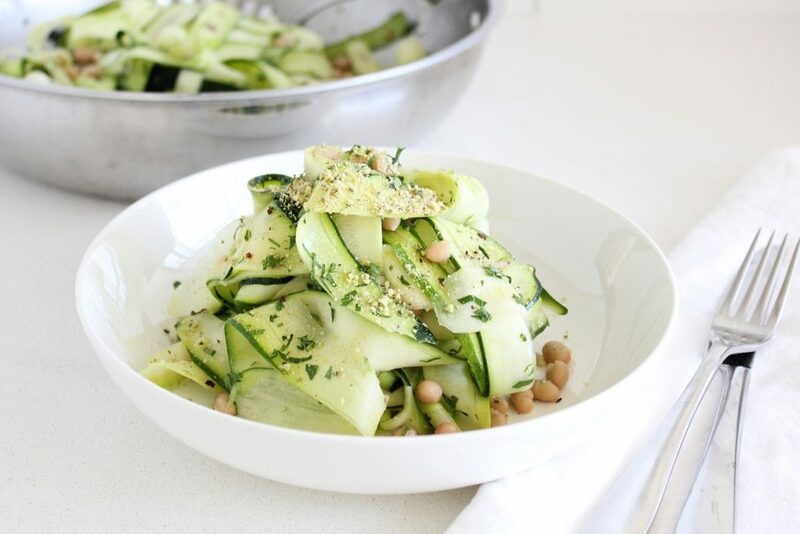 I haven’t even used a spiralizer for this recipe, I just used a peeler and literally peeled the zucchini all the way around, over and over until I whittled it down to the seeds at the core. I don’t use the seed part for pasta because I find it gets too wet and mushy once lightly cooked or even just seasoned. Instead, I chop up the seedy core and freeze it to add to smoothies in place of ice cubes. It’s watery and bland enough to work, try it! If I get too many I’ll also throw them into a tomato sauce. They are happy to blend in to most things, there is no need so compost them. 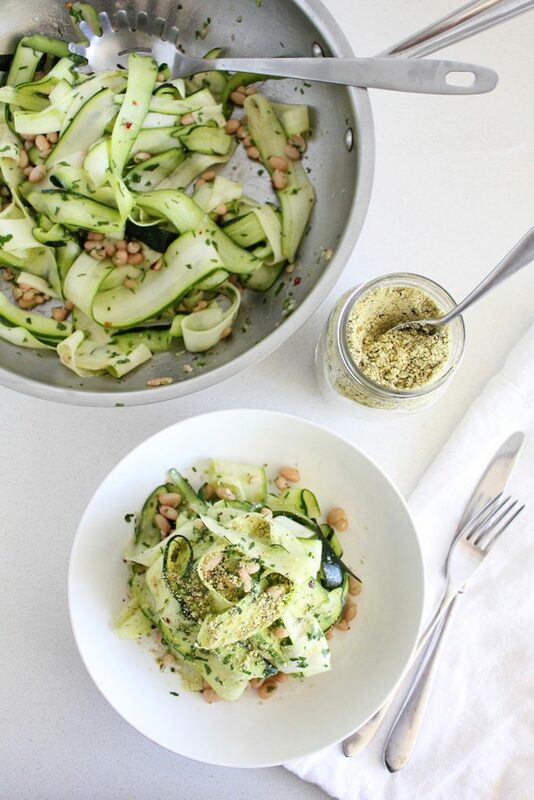 Zucchini is no kale in the nutrient-density department, but it does have some anti-cancer properties and the very fact that it easily subs in for inflammatory/high-glycemic pasta, makes it deserving of a gold star. 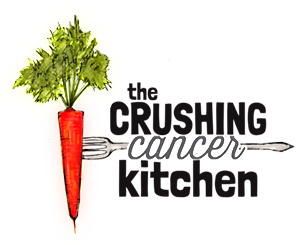 Try to find un-sprayed/organic so that you can leave the green (or yellow!) peel on, for extra antioxidant-rich pigment. 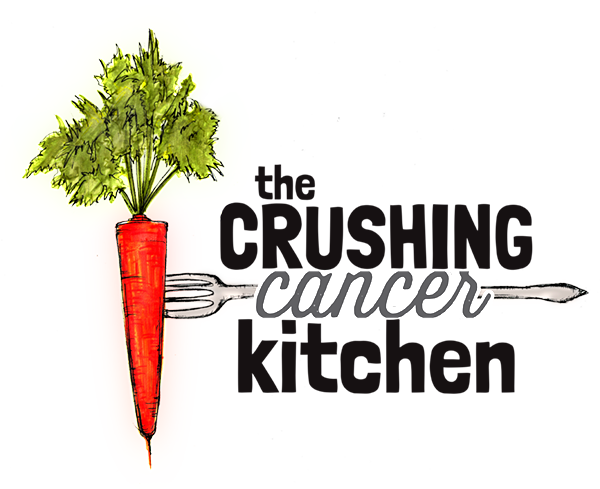 Garlic, on the other hand, can totally hold it’s own in the nutrient-density realm. We have talked a lot about garlic recently, and this is just another recipe to get your fill. 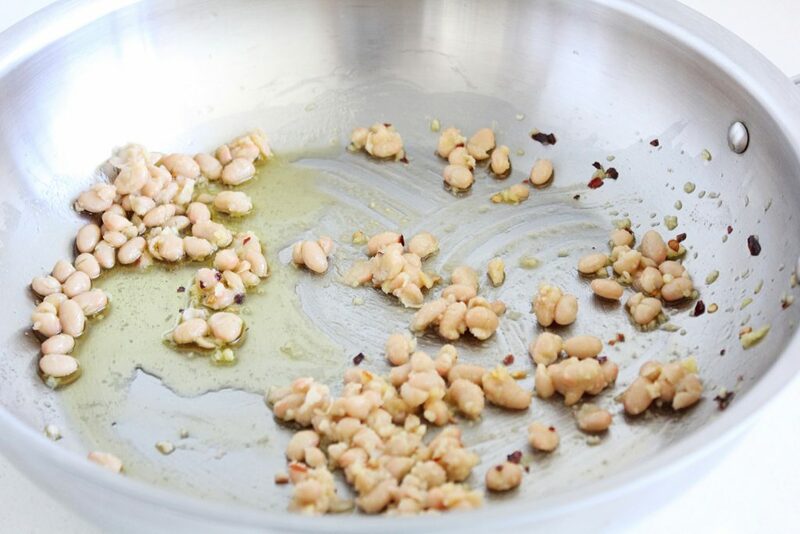 We lightly warm it in the olive oil (not an oil that we generally use for cooking, but a gentle warming with the garlic and chilies helps to bring out their flavour, take the raw edge off, and flavour the oil too). We then top it with our Plat-based Parmesan -a must to have on hand in your fridge at all times. As is this, would make a very light summer meal, especially if your appetite is currently on the small side. For me, it would be followed by a giant bowl of ice cream, especially with the amount of stroller-pushing I’m doing these days. So, to avoid this, I’ve added some navy beans, which add some extra fiber, complex carbs and protein, all of which will tell your body and brain that the ice cream store is too far away and that you should settle for a second helping of these shockingly good non-noodles that taste just enough like the pictures your sister recently sent you of her trip to Italy. 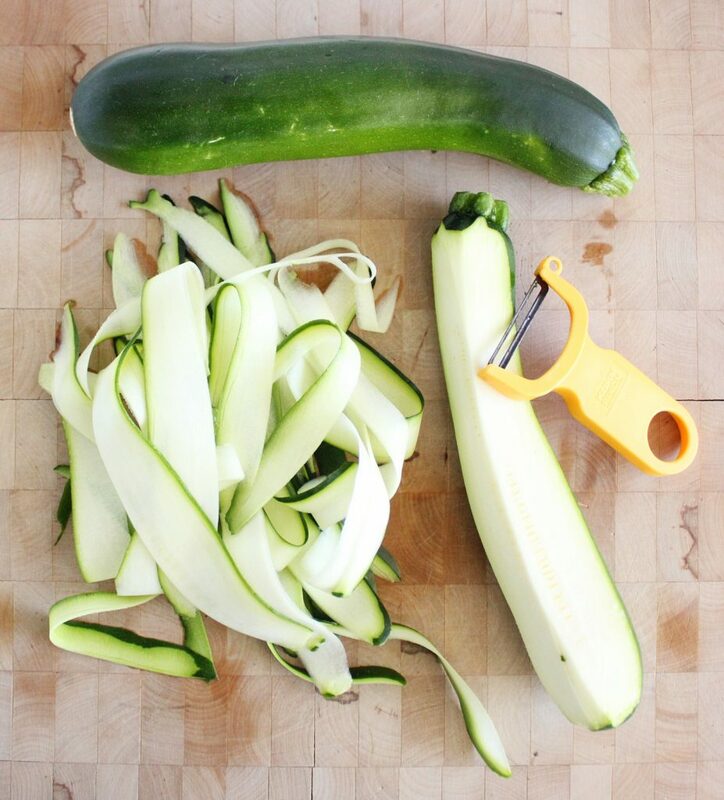 Peel the zucchini all the way down to the seedy core (reserve the core for smoothies). 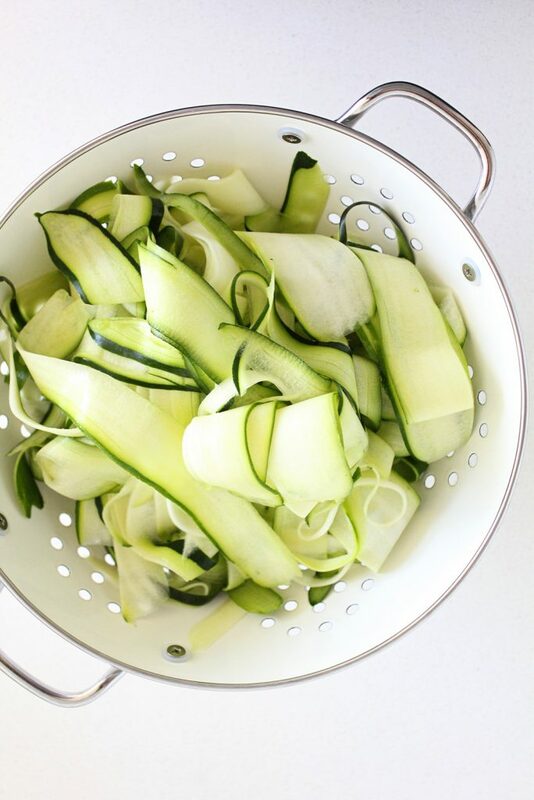 Toss the long strips of zucchini with a good pinch of salt and let drain in a colander. 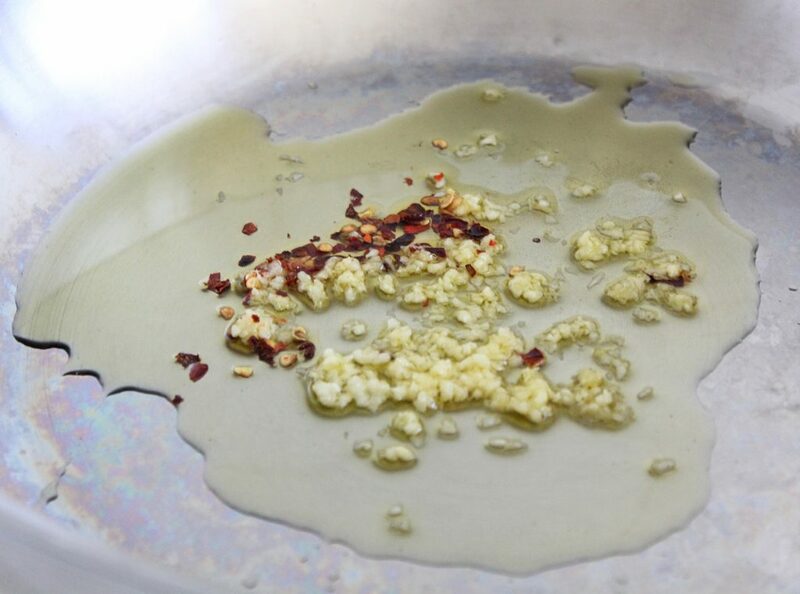 Meanwhile, in a large frying pan, warm the olive oil with the garlic and chilies until it just begins to sizzle. 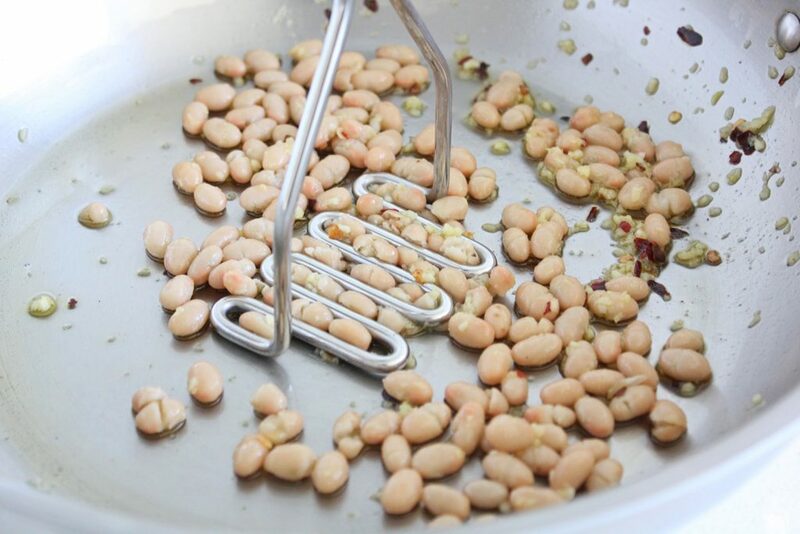 Turn down the heat and add the beans, crushing them a bit with a wooden spoon, fork or potato masher. 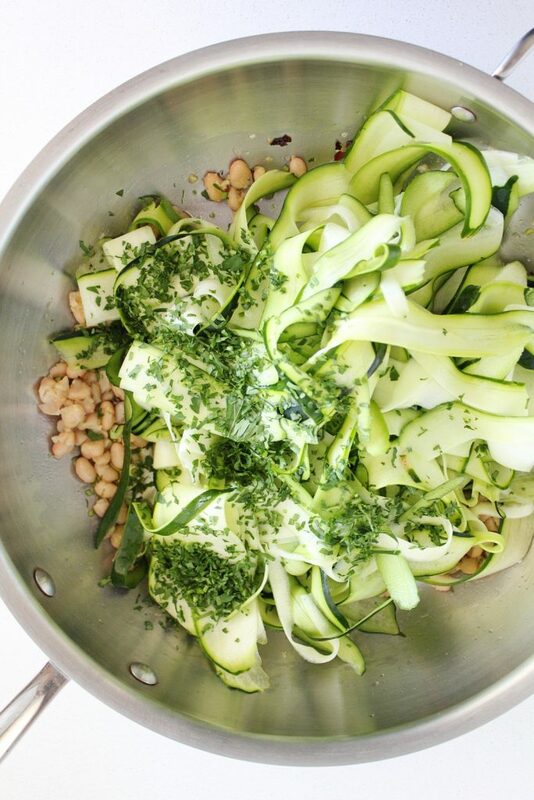 Add the zucchini, just barely warming it through (it will maintain a pasta-like texture until it is cooked through, then it just tasted like cooked zucchini). Add the parsley, tossing it through. Taste and adjust the seasoning (salt). Plate and finish with a fresh drizzle of extra virgin olive oil and plant-based parmesan (see link in body of this post).